Back at the beginning of the summer, I found a recipe through a related link for this amazing vegetarian asparagus-pesto lasagna, and decided to try it out. I got the majority of the ingredients from the farmer’s market. 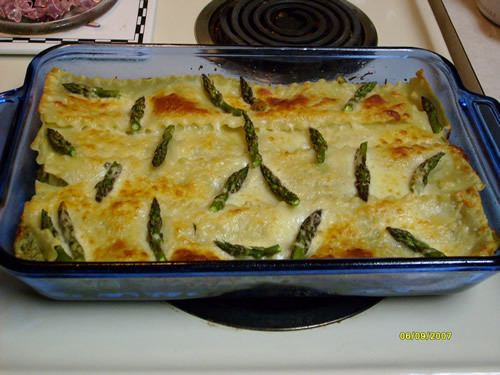 After it was baked, I offered it to the girls, and they didn’t want anything to do with it because of the asparagus. Until they tried it. Everyone who got a taste of the stuff then has brought it up from time to time ever since. 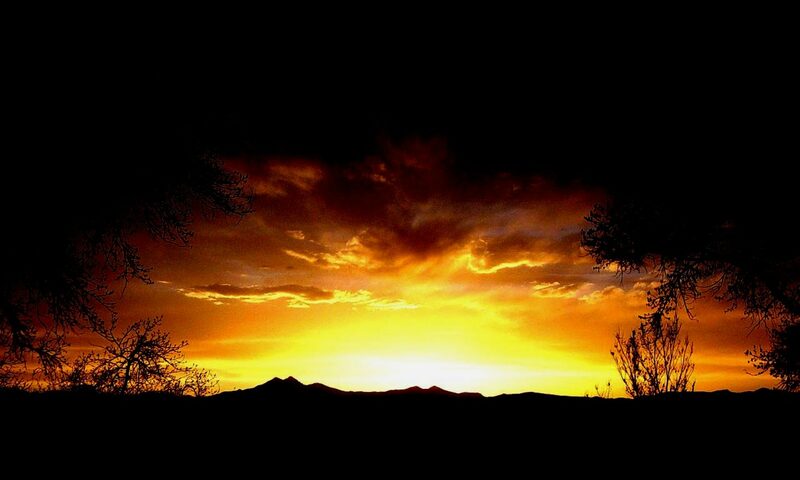 In preparations for making it again, I was looking at the recipe, and remembering some difficulties. So, I’m posting the recipe again with some modifications so that I can reproduce it easier in the future. 6 Tbs Pesto (the freshest you can find or make). Noodles: If you are using the no-bake noodles, they are ready. If you are using regular lasagna noodles, boil them to the point just prior to being al dente. Steps one and two below are independent, so if you have extra hands on deck, both can occur simultaneously. Preheat oven to 350°. Whisk flour and ½ cup of milk in saucepan until smooth. Gradually whisk in remaining milk. Bring to a boil over medium heat, whisking constantly, and boil 1 minute, until thickened. Remove from heat: stir in pesto, Parmesan, salt, and pepper. Reserve one cup of this sauce. Warm oil in a large nonstick skillet over med-high heat. Add chopped asparagus (except tips) and cook, stirring often, 5 minutes or until tender. Add garlic, cook, stirring, 1 minute and season to taste with salt and pepper. Remove from heat. Coat 13 x 9 baking dish with cooking spray. Place layer of noodles in dish, overlapping slightly. 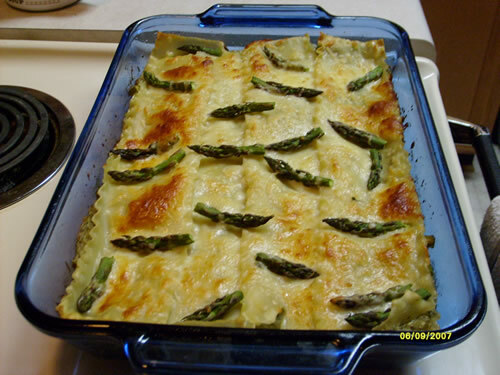 Layer with half of cooked asparagus, ¾ cup cheese and half of sauce. Add another layer of pasta, remaining sauce, remaining cooked asparagus, and ¾ cup cheese. Top with a layer of noodles, then with reserved cup of white sauce. Arrange reserved asparagus tips over top and sprinkle with remaining cheese. Bake, uncovered. 35 to 45 minutes, or until golden. Let stand 10 minutes; serve with additional grated Parmesan. When I made it the first time, it didn’t seem like there was enough of the white(pesto) sauce. This time, I think I’ll double the ingredients for just the pesto part. If I end up with too much, I could always just make the whole thing a couple of layers taller. This recipe is amazing, and it refrigerates and freezes very well. Yeah. That’s what the girls said. Until they tried it. Then I had to ration the stuff out until it was all gone…. Everyone who tried it, especially those who “do not like asparagus” loved it. LOVED it! Lasgana is not meant to be veggie. It should have MEAT AND CHEESE AND RED SAUCE! Ummm… Like Spaghetti, Macaroni, Ziti, and any other shape of pasta, the word Lasagna refers only to the shape of the noodles. The next time I go to your house, I’m bringing macaroni noodles in a tomato sauce. and I’m making sure that there is no cheese sauce anywhere near, too! Ha! Previous PostPrevious web 2.0 brgrs!